Setting up a classroom for students with autism can be time consuming and expensive. In today’s economy, with budget cuts and school districts cutting back on expenses, that challenge is intensified. From communication tools to games and software, the price list seems endless. However, there are many ways that a person can create a useful and effective autism classroom on a budget. Designing the classroom is an important element in creating the type of room that fosters successful students. 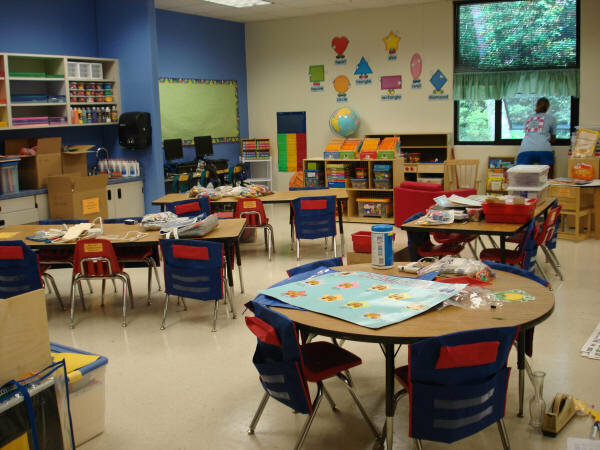 Here are some ways to save dollars on the materials and items used to design the classroom. When designing a room, a teacher can use card stock paper for creating name cards instead of buying pre-made name cards. Clear packing tape can be used to laminate items by sticking the tape to both sides of the item. Teachers who currently teach in a school that they will be returning to the next year can check the school art closet at the end of the school year to prepare for next year. There are usually a bunch of items in the art closet that are just sitting there waiting to be used to create useful materials. For example, construction paper, 3-hole punch devices, glitter, finger paint, scissors, clip boards, permanent markers, note pads, folders, tape, poster board, staplers and other good finds are just waiting. Just ask the principal or secretary if it is alright to take a look in preparation for next school year. Index cards are another item that are inexpensive but can reap large benefits. Index cards can be used to make a number of teacher-made items such as matching games, alphabet flash cards, number cards, picture identification cards, labels for bins and more. Simply use a permanent marker and good handwriting (or if handwriting is a problem, print out what you want on the computer and glue it to the index card) and you have teaching materials that are also easily replaceable. Furniture, of course, can be costly, however, recycling can be called to play by using old sturdy bookshelves to use as a storage place for materials for a work station. Teacher’s desks should never be the focal point of a classroom, especially in a classroom teaching students with autism. However, if a desk must remain in the room, a teacher can set up the teacher’s desk in such a way that it doubles as a divider. For example, the desk can help to create a division in the room which allows for various areas like an independent work area or play area. When creating a division in the room, it is usually common that one would use heavy partitions or study carrels which can cost hundreds of dollars. To save some cash, use cardboard/corrugated dividers instead of expensive partitions. Dividers like these can be found at Calloway House Inc., a website that sells classroom products. These dividers are light-weight and can be removed and stored away easily or can be secured by placing something such as a desk or table on both sides of them to help them stay up. Decorating can be cheap too. Teachers can start by making their own bulletin board boarders by using construction paper strips and gluing on small designs created by the students. Bulletin board paper can be used in other ways too. If needed, a teacher can use bulletin board paper to cover distracting items or shelves that appear cluttered. If a teacher’s school will not order one of those expensive carpets from a catalog or an online store, he or she can try putting together two or three “furry blankets” from a discount store like Marshall’s, TJ Maxx or Ross. Also, for a classroom set up, teachers should make use of the numerous websites that provide free materials. Download free materials, schedules, and visual supports on sites like AutismClassroom.com. Classroom Organization can present some ways to save as well. First and foremost, a teacher can use dollar store tubs as storage bins for student work, lessons plan materials and more. Zipper baggies of various sizes come in handy for just about every aspect of the classroom environment. The smaller baggies make great storage for flash cards, and the jumbo bags can be used as a reward/reinforcer bag to store large toys or to store extra clothing or student’s personal belongings. Similarly, reusable food storage containers of all sizes, double as toy storage containers, art supplies containers, reward containers and work bin containers. If bigger containers are needed, check for back to school sales on Rubbermaid-type 20 gallon containers, which can be as low as $4.00 each. Buying pocket folders when on sale (at back to school time) is another way to save. Many times you can get folders for 5 cents or 10 cents in late July or early August at office supply stores. In addition, we know that data binders are an important tool in organizing the student’s progress on their personal goals. Educators can make dividers for the student’s binders by using colored construction paper or card stock paper instead of buying pre-made tab dividers. If a teacher is savvy with the computer, he or she can create their own free data sheets using the “Create Table’ section of a word processing program or do an internet search for “data sheets” to find some that are right for the needs of the students. Recycling old binders to use for the student’s data binders or asking the principal or other teachers if they have any unused binders can also save loads of cash. If a classroom has no shelf space, recycle old sturdy bookshelves to use as shelving if needed. Classroom organization can also be helped a bit by asking parents to send in old, cleaned containers such as margarine, butter, or oatmeal containers. These items can be used to store toys or to store puzzle pieces or small pieces for work tasks. Communication is a huge deal in a classroom for students with autism. The goal is always to increase the student’s ability to express and receive a message. There are some ways to do this without spending a lot of money. To start with, a person can print picture icons in black and white, instead of color, to save on ink. Next, they can try using an internet search to find images for communication tools. They just need to be sure that it is a clear picture of just the item and it does not have anything in the background. Additionally, teachers can save loads of money by using the real object as a communication tool or by using a cut out of the actual package of the product. The cut out can be laminated or placed in a zippered baggie and exchanged back and forth for students who may be non-verbal or who may use limited speech. Teachers can use pocket photo albums as communication books. They are found at most dollar stores, are lightweight, and can have picture cards inserted and removed easily. Schedules which are needed in many autism classrooms can be made using card stock paper or file folders. Finally, communication costs can be lowered by the teacher bringing in real items from home when teaching concepts in a specific lesson. This has an added benefit of providing a hands-on experience for the students. Play time and leisure time products can be costly, but here are some tips for easing the burden on the wallet. Classroom teams can shop yard sales for “fidget” toys and age appropriate toys. A favorite yard sale find is the small windup toys usually found in kids meals at various fast food restaurants. They make great reinforcers for children (be sure to monitor their use closely if any students are prone to place things in their mouth.) At yard sales, sometimes someone may be willing to let go of a huge bag of these items for as little as $5.00. Swapping toys on a rotating basis with another classroom teacher in the building can help save some money as well. Additionally, teachers can check AutismFreeZone.com for products that others may be donating. Games such as a matching game can be made pretty inexpensively using two identical decks of cards from the dollar store (shapes cards, letter cards, number cards, etc.) This theory works the same for paint “chips” from the hardware store or identical photographs, both of which can make simple matching games. To assist with purchasing items for a sensory area in the classroom, teachers can ask parents or community supporters to send in items for a sensory area (ex. lotion, shaving cream, finger paint, weighted blankets.) If that is not possible, making sensory items may be the best solution. For example, a “weighted sock” can be created using tube socks and dry rice. Also, a teacher can try using three or four pillows inside of a sewn sheet as a sensory body pillow. If tactile sensory items are needed, creating a “squishy” toy using finger paint inside of a zippered baggie may just work. Just be sure to secure it with several baggies, duct tape, and adult supervision! Teachers needing to create an autism classroom on a budget should take advantage of many of the free and low-cost materials offered via the internet. For students, Zone for Autistic Children is an internet browser that offers safe connections to websites for children with autism. Starfall.com is a website for young children working on alphabet and reading skills. These are only two sites out of many that teachers can utilize for free. For the adults on the classroom team, the internet offers a variety of free training related to autism. For example, AutismSpot.com, AutismClassroom.com, PostivelyAutism.com, and ChildNett.tv all offer training and or videos with great information for educators and parents too. A fairly new site, AutismInternetModules.org, offers a full array of over 15 in-depth self-paced training modules that educators can take over the web. Lastly, low-cost books such as How to Set Up a Classroom for Students with Autism (available electronically at almost half the price of the paperback) and How Do I Teach This Kid to provide invaluable tips for little cost. These tips will hopefully help add substance to the classroom while keeping the money in the pocket! I am not sure who wrote this blog but I would love to communicate with you more as well as others who teach an autism classroom. I was hired to teach an autism classroom about a year ago. The hardest thing I face with this job is accepting that I am doing the best I can under the energy, time, and money constraints. I started with nothing last year. I want to meet others who have walked in my shoes to find out how long it takes to have everything set up and are if there are a lot of changes each year. The teacher before me had a nervous break down and left. I do not want that to happen to me and I want my paras to accept I am different from her so it may take me longer to organize as I do have a personal life and do not wish to spend all of my time at school. The district offers no prep time, which is different from other districts, but I like it here….just wish less of my time and money would be spent at work. I need to stick to my limits. Thanks in advance for any possible suggestions! I believe this is beyond a GREAT idea. There are some people in this world who are not as fortunate as others. This is why I have established The F4R cause and will continue perusing it. Who knows if F4R receives enough donations I would be glad to contribute. It is the least I could do to help provide to autistic needs. help raise donations and make this happen! This is such a helpful blog anyway, whether we’re teaching autistic students or not, a lot of this can apply to any classroom. Thank you.